How do you cope with cold weather? Do you embrace it, avoid it or find carefully crafted ways to enjoy it (ie. with lots of layers and warm beverages)? I’m in the last category. I appreciate the magic of winter but need to be surrounded by multiple sources of warmth to get through it with a positive attitude. Mulled wine is one of those beverages that truly elevates the winter experience. Imagine standing in the midst of a Christmas market like Chicago’s own Christkindlmarket, surrounded by twinkling lights and enjoying a steaming mug of spiced wine as fluffy flakes of snow settle softly around you. It’s hard not to admit that winter has some charm when you find yourself in such a lovely situation. Typical spices for mulled wine include ginger, cloves, cinnamon, star anise, cardamom and nutmeg. While I love the flavor and aroma of this combination, I wanted to try a different direction. What comes to mind as a natural pairing to red wine? Chocolate and cheese would be the most notable but cheese is probably not what you want actually in your wine (if you find a way to do it, more power to you). I settled on the concept of chocolate and thus decided to infuse my wine with cacao nibs, Ceylon cinnamon, cardamom and Cara Cara orange. I looked for a rich red wine with chocolate tasting notes as the base to complement the cacao nibs. The Chilean Cabernet Sauvingon by Root: 1 was the perfect price point (I recommend not spending more than $10 on a bottle if you’ll be infusing it or adding juices) and the ideal flavor profile - black currant, mocha and chocolate. Though I used cacao as my main flavor, I decided to add the Ceylon cinnamon and cardamom as they both pair beautifully with chocolate. I added both the peel and juice of a ripe Cara Cara orange to get both the bright essential oils of the skin and sweet tartness of the orange itself. Cara Cara oranges are my personal favorite as they’re sweeter and more flavorful than the typical navel variety. Finally, I sweetened the wine with a German honey liqueur for both an extra kick and a smooth, richer sweet flavor. If you can’t get your hands on a honey liqueur, consider adding honey and brandy as a substitute. I prefer to make my mulled wine slightly more tart than sweet but feel free to play with the ratios to your liking. The resulting mulled wine is warming and refreshingly bright with a delightful lingering flavor of spiced chocolate on the finish. It’s the perfect drink to share with friends or family anytime in the winter but especially over the holiday season. Add all ingredients to a pot and put on the stove on low heat. Bring to a light simmer and keep at that temperature for 45 minutes - 1 hour, stirring and tasting occasionally. Strain and serve immediately when ready. Garnish with a cinnamon stick or orange twist and enjoy with loved ones and good cheer. Thanks to Belen Aquino for the stunning cocktail photography and to Gather Vintage Tablescapes for the beautiful vintage glasses and tray. Living in the Midwest, you get used to unexpected seasonal patterns. Some years, we get graced with a beautiful spring but usually it's a bit of a climate roller coaster. Don't get me wrong, I love seasons. It's the change and uncertainty that make us Chicagoans appreciate nice weather when it happens and to fully take advantage of it. After six months of winter and several April snow showers, I was thrilled to see crisp green buds appearing on trees and fragrant flowers popping out of the ground. Even with some unavoidable variation in temperatures, we've been spending every evening dining on the rooftop and delighting in the sunset displays. For me, springtime evokes a transition from anticipation to wonder as life and color return to the outside world. I wanted to capture the coming of spring in a brunch-friendly cocktail just in time for Mother's Day. My goal was to create something delicate, fragrant and wonderfully smooth. I had recently gotten my hands on some St. George California Citrus Vodka and let its crisp floral flavors inspire my brainstorming process. Gravitating typically to gin or whiskey, I hadn't previously found a vodka to write home about. I typically approached vodka as an ingredient to disappear and allow the other components of the cocktail to shine. This vodka, however, is so ridiculously delicious that it can easily be enjoyed neat at room temperature. Built on a foundation of Barlett pears with no additives, the vodka is then infused with Valencia orange, Seville orange, and bergamot peels. The resulting spirit shines with bright citrus and herbal notes with an almost sweet juicy finish. I thought the vodka would pair nicely with a jammy flavor so I incorporated some cold-brewed hibiscus tea. Hibiscus has a stunning natural hue and a vibrant tartness that I thought would enhance, rather than overpower, the vodka's citrus notes. Then I decided to get a little weird and try out an ingredient that has always mystified me in cocktails: yogurt. Though it sounds bizarre, Greek yogurt in particular can add to a cocktail's tartness while also imparting a creamy texture. I promise that it doesn't taste like eating a spoonful of plain yogurt - you just need to be smart about the other ingredients you mix it with. I chose to work in a wildflower honey syrup to take the bite our of the yogurt and blend it in as a more complimentary rather than center-stage component. The honey worked beautifully to tie everything together and balance out the tartness of the hibiscus and Greek yogurt. I finished the drink with some stunning edible flowers I spotted at Whole Foods. I have been hunting for these in stores for some time and haven't yet had the chance to plant them in my own garden. Whole Foods packages up a variety in the refrigerated herbs section - just be sure to get them shortly before you plan to use them as they do spoil quickly. I love how the flowers enhance the vibrant character of this cocktail and create an extra special treat for whoever you choose to share it with. The resulting cocktail is lightly tangy with notes of citrus and jam rounded with a creamy sweet smoothness. It's delicious at any time of day, but I think it would be especially wonderful with brunch. Add all ingredients other than flowers to a shaker with ice and shake vigorously until chilled and frothy. Strain into a Nick and Nora or other stemmed glass and garnish with 1-2 edible flowers. Enjoy outdoors to complement the delicious brunch you prepared for your mother. Thanks to Belen Aquino for the stunning cocktail photography and to Gather Vintage Tablescapes for the beautiful vintage glasses. Ever since I can remember, I've had a strong love for tea. Fresh, energizing green teas tend to be my favorites, but I've truly enjoyed most varieties I've tried and always look forward to expanding my tea knowledge. Without doubt, I have my father to thank for this appreciation. He's been teaching me about tea since my youth and continues to share new ones that he's discovered. Perhaps you can say that each of our food and beverage loves is a mix of genuine flavor perception and nostalgic or emotional value. Given my feelings toward tea, I take hot toddies very seriously. The traditional hot toddy is a cocktail made with tea or warm water, liquor, lemon, honey, and optional spices. In my opinion, if all you can get at a bar is a Lipton tea bag with a packet of sugar, a piece of lemon, and a hearty pour of rail whiskey, perhaps grab a beer instead. Hot toddies are a drink to be treasured and appreciated because they allow so much room for experimentation. You can dream up countless combinations by swapping teas and playing with herbal and spirit components. Even the variety of honey you choose plays a pivotal role in the flavor profile of the finished cocktail. I wanted to take the hot toddy inspiration to a more imaginative level with an unexpected tea, surprising botanicals, a quality spirit, and the use of my favorite type of honey. If all of these ingredients seem daunting, feel free to play around while sticking with the basic rations. Consider starting with a tea and honey you have in your pantry, then work your way to acquiring these specific ingredients if you're hooked on the hot toddy concept. I started with a base of hot osmathus oolong tea and added Copper and Kings American Craft Brandy, buckwheat honey, fresh lemon and 11th Orchard Birch Bark Bitters. The tea has a buttery sweetness with floral and fruity notes from the osmanthus. It's wonderful enjoyed on its own and really makes this drink shine by creating a smooth and complex foundation. I took special care selecting a smooth spirit to add to the cocktail as serving a drink warm can amp up the bite of sharper varieties. Copper and Kings American Craft Brandy gave me exactly what I wanted - oak-aged smoothness with a hint of fruity spice. If you've never tried buckwheat honey, I highly recommend you get your hands on it. It's on the dark end of the honey spectrum, almost like a molasses, with a distinctive scent and a rich, nutty, slightly bitter flavor. It's not for everyone but it'll be a game changer in your drinks if you enjoy the taste. I grab mine at a local honey farm in Southern Wisconsin which offers the added bonus of helping with seasonal allergies (eating local honey can help with pollen sensitivity). The honey added smoothness and aroma to this cocktail, blending beautifully with the oolong and brandy. I finished off the drink with some fresh lemon for balance and a dropper of birch bark bitters for brightness. The bitters are from a new Chicago-based company called 11th Orchard who specialize in locally foraged ingredients that are indigenous to the area. All of their products are fantastic but the birch bark variety really surprised me with its minty sweetness. You won't be able to find these bitters in stores outside of Chicago, but they're available for purchase online. The resulting cocktail is warming, unbelievable smooth and uplifting with its rich bouquet of fruity, nutty and floral aromatics. If you have a tea set at home, it'll make the presentation even more lovely and special for your guests. To make cocktail, brew and strain tea and allow to cool to drinking temperature. Stir in buckwheat honey until dissolved, then add brandy, lemon juice and bitters. Serve in a tea cup and garnish with a fresh or dehydrated lemon slice. Enjoy while savoring the last few weeks of winter and calming your eager anticipation for springtime. Thanks to Belen Aquino for the stunning cocktail photography and to Gather Vintage Tablescapes for the beautiful vintage tea set. After first setting eyes on a Smoking Gun at Apogee Lounge, one of the most imaginative bars in Chicago, I knew I'd eventually need to add one to my arsenal of mixology toys. Quite conveniently, the maker Breville reached out and offered to provide me with one in exchange for participating in a virtual holiday "mix-off" along with 9 other influential bartenders and mixologists. Getting the opportunity to play with a new medium made me want to take my cocktail creation in a completely different direction from anything I'd done before. I selected Japanese whiskey and sherry to form the backbone of my cocktail. Both are ingredients that are praised in modern cocktails yet I had only tried them when going out for drinks. I quickly found that Japanese whiskeys come in quite a range of prices and flavor notes but Kikori Whiskey seemed like a particularly intriguing option to mix with. Made entirely from rice and aged in sherry casks, Kikori feels like a mash-up of the best attributes of saké and more traditional whiskey. It's a wonderfully unique addition to the world of whiskey and features a floral aroma with a caramel smooth finish. I also learned that sherries come in many varieties, each of which boast a unique flavor profile. Sherry is defined as Spanish fortified wine crafted in the region surrounding the city of Jerez de la Frontera (the word "sherry" stems from "Jerez"). Within that category, the wines vary from very dry to sweetened and have undergone different degrees of aging and oxidization. I chose the Manzanilla variety which falls on the drier end of the spectrum and was named with the Spanish word for chamomile tea due to flavor similarities. I played up the floral notes in the whiskey and manzanilla sherry with fragrant fresh-squeezed Meyer lemon juice and a wildflower honey syrup. The honey syrup balanced the dryness of the sherry, and the Meyer lemon juice tied the other ingredients together with a touch of pleasant acidity. The coolest thing about using the Smoking Gun in creating a cocktail is that you can fill it with a number of different wood chips, dried herbs or dehydrated fruit. This allows you to enhance the drink's flavors by engaging the sense of smell and truly takes the cocktail to the next level. I used applewood chips and dried chamomile flowers to smoke this drink. The applewood chips created a sweeter, fruity smoke and were a perfect match for the floral sweetness of chamomile. As a sidenote, I highly recommend getting dried chamomile flowers in bulk instead of buying it in teabag form - it's cheaper, more flavorful and lovely for garnishing! The resulting cocktail is a bouquet of flavors unlike any I've enjoyed before - it starts out with a bit of floral dryness, transitions to the creamy smoothness of the honey and whiskey and finishes with a touch of sweet smoke. Add first four ingredients to a mixing glass over ice and stir until chilled. Cover mixing glass with a julep strainer so only the spout is exposed. Insert the tube of the smoke gun through the mixing glass spout. 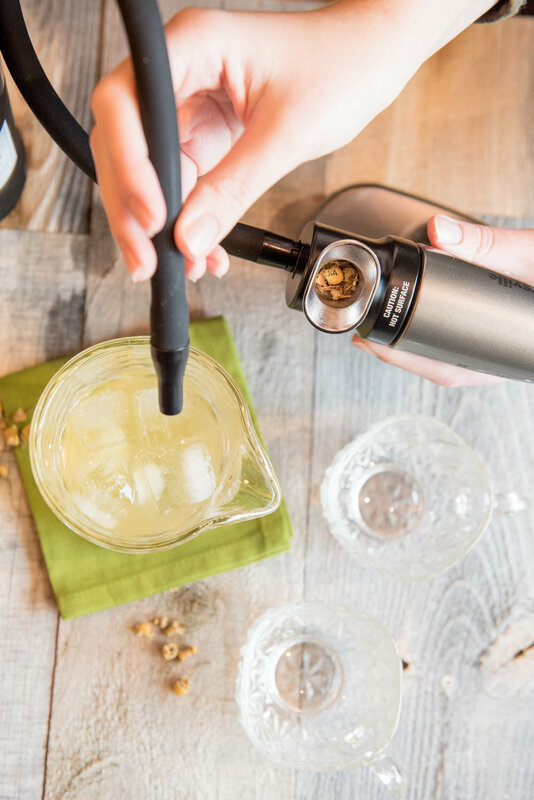 Place a light covering of applewood chips and dried chamomile in the burn chamber of the smoke gun, ignite, and use the higher fan setting to fill the mixing glass with smoke. 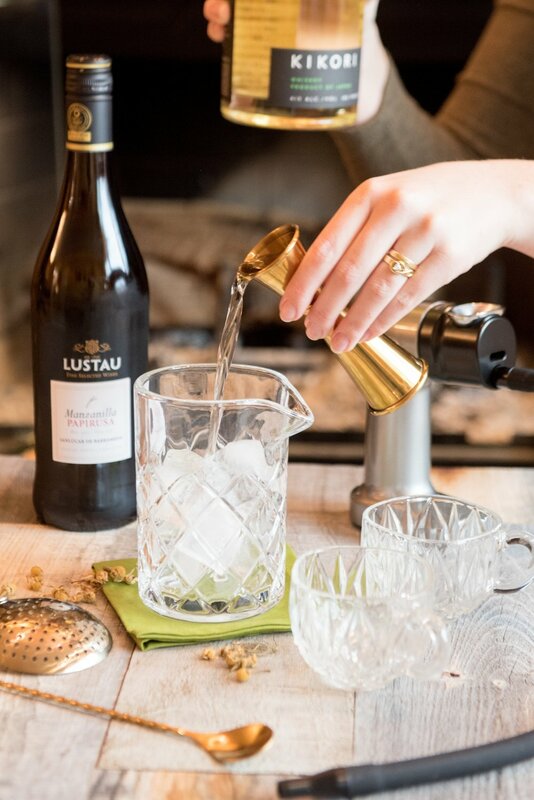 Once filled, remove the smoke gun tube from the mixing glass, change the orientation of the julep strainer so the handle covers the spout and allow for the cocktail to infuse with smoke for several minutes. Give the mixing glass a swirl and strain the contents into a Japanese tea cup or punch glass. Garnish with fresh chamomile flowers. * To make wildflower honey syrup, add 1:1 parts wildflower honey and almost boiling water to a leak-proof glass jar and shake until honey is dissolved. Open jar to allow syrup to cool and store excess in the fridge for up to 1 month. Thanks to Belen Aquino for the stunning cocktail photography and Breville for the Smoking Gun. Chances are, you have a strong feeling about anise and therefore about absinthe. Either it's a spirit you swear by to bring an edge to your cocktails and pay homage to classic recipes, or you avoid it at all costs. I used to be part of the latter group but I tend to view flavor dislikes as an exciting challenge. In my opinion, it's far more rewarding to make a cocktail you love with an ingredient you're weary of than with an ingredient you invariably enjoy. I had only experimented with absinthe once in the past, and it was somewhat of a rocky start. I didn't think twice about starting out with a 0.5 oz pour of the absinthe in a gin-based cocktail and then spent over an hour trying to keep it from overpowering all the other flavors. On my second try, I approached more cautiously. Chicago Distilling Company graciously shared a beautiful bottle of their Lanfray's Trigger Green Absinthe (available locally) and I wanted to highlight its character in a drink with broad appeal. I had recently acquired a bar spoon and decided this would be the perfect occasion to try it as a unit of measurement. It's far easier to add more of an ingredient than to have to correct for an overly zealous pour. To complement the abinthe's herbal character, I used Chicago Distilling's Finn's Gin. Finn's is a more modern take on gin and therefore a pleasure to mix with - think less juniper and more other exciting botanicals such as green cardamom, Szechuan peppercorn and hibiscus. If you need any more reason to give it a try, Finn's keeps it local by using entirely Illinois grain. I wanted the herbal quality of this cocktail to be appreciable yet smoothed over for broader appeal. Egg white foam balanced out the bite from the gin and absinthe while blood orange added a bright freshness and honey contributed a pleasant hint of sweetness. I added just a bit of lemon to maintain some tartness as blood orange is much sweeter than your typical citrus fruit. The resulting drink is creamy, dreamy and reminiscent of the classics with a modern twist. If you have some time on your hands and want to experiment with adventurous garnish, I recommend trying your hand at dehydrated citrus slices. They'll last in an air-tight container in the fridge long after your favorite citrus fruit goes out of season. Plus, though dehydrated citrus is a tad time intensive to make, the process itself is quite easy. Simply cut up the citrus (I used blood oranges for this cocktail) into 1/4" slices, place on a cooling rack layered on top of an aluminum baking sheet and place in the oven on 180 degrees Fahrenheit for about 6 hours, flipping the citrus slices halfway through the baking time. Dry shake all ingredients (without ice) for 10-15 seconds, popping the cap occasionally to release the pressure from the egg white. Add ice and shake until chilled. Strain into a coupe glass and garnish with a dehydrated blood orange slice. Enjoy while lounging on a velvet settee and getting lost in some vintage tunes. *To make honey syrup, heat a half cup of honey and a half cup of water in a small pot at low heat. Stir frequently until honey dissolves to avoid boiling. Allow to cool and store excess in the fridge for up to 3 weeks. Thanks to Belen Aquino for the stunning cocktail photography and to Gather Vintage Tablescapes for the tray and lovely vintage coupes. This time of the year, while a whirlwind of giving and celebration, is also an important time to look inward and consider your own fulfillment. My mixology craft has brought me so much satisfaction through the ability to grow creatively, the positive feedback loop with my followers, and the relationships I've been able to build with like-minded brands nationwide. The excitement of sharing something delectable and beautiful can truly cure me of any worry. Earlier this month, I had the very special experience of getting a private tour and tasting at KOVAL, one of my favorite local distilleries. Learning about the brand gave me such a profound appreciation of KOVAL's innovation, attention to ingredient quality, and inspired brand design. I enjoyed every spirit and liqueur I sampled, but was especially impressed with the barreled gin and barreled peach brandy. Not only were both bottles absolutely stunning, but the spirits themselves were unique, well-balanced and begging to be mixed into a delicious beverage. I figured the barrel-aged flavors of the gin and peach brandy would pair well but wanted to make sure both spirits were highlighted in the resulting concoction. Honey and Meyer lemon came to mind as the perfect complements. A honey simple syrup contributed smooth, buttery sweetness while fresh squeezed Meyer lemon and lemon twist garnish brought a touch of tartness and enhanced the cocktail's botanical profile. I also added a dash of ginger bitters to enhance the spirits' spice without diluting the drink's strength. The result is a definite crowd pleaser for gin and whiskey drinkers alike with its sweet, lightly spiced body, balanced tartness and pleasant herbal finish. Add all ingredients to a mixing glass over ice and stir until chilled. Strain into a coupe glass, garnish with a lemon twist and enjoy over a spirited chat by a roaring fire. Thanks to Belen Aquino for the stunning cocktail photography and to Gather Vintage Tablescapes for the lovely crystal coupes. All of us cocktail adventurers tend to have spirits we favor and those that make us slightly uncomfortable. Even as I broaden my horizons, I find that I have to consciously challenge myself to stray outside my comfort zone. Is the extra effort worth it if you can already make good drinks with ingredients you know? As with all other aspects of life, challenge leads to growth and feelings of accomplishment. Of course, the strongest feeling of accomplishment comes when you can create a recipe you enjoy, but this is easier than you may think. The next time you’re at a nice cocktail bar, order a drink with a new, intimidating liquor and pay attention to the complementary ingredients and balance of flavor. This is typically how I start mapping out the possibilities with a new spirit or mixer for home mixology. The last cocktail of my Thanksgiving series features two new ingredients to my arsenal – Drambuie (a liqueur dating back to early 20th century Scotland, consisting of Scotch whiskey, heather honey, herbs and spices) and a Single Malt Scotch Whiskey. I’m not a big Scotch drinker and I tend to stray from smoky flavors. However, I found Drambuie to be an excellent cold weather liqueur with its sweet, spiced profile, and this $17 Trader Joe’s find was a noncommittal opportunity to try a smooth, young Scotch option for mixing. I wanted this cocktail to channel everything I love about pumpkin pie – sweet pumpkin puree, creamy texture and fall spice galore. I found that it’s quite easy to use canned or homemade pumpkin puree in cocktails if you shake all the ingredients together vigorously for an even mix. If you want to avoid the pumpkin sediment, you can always use a finer mesh strainer when pouring the cocktail. Egg white and lemon helped me achieve the creamy texture and perfect froth. A lemon twist also made for lovely garnish for the final presentation. If you’re like me and can’t get enough of fall spice, you can top the drink with some cinnamon sugar, pumpkin spice blend or freshly grated nutmeg. The result melts in your mouth with delightful sweetness and makes a wonderful substitute or pairing for the dessert course. Dry shake all ingredients (without ice) for 10-15 seconds, popping the cap occasionally to release the pressure from the egg white. Add ice and shake until chilled. Strain into a stemmed crystal glass and garnish with a touch of fall spice and a lemon twist. Enjoy while toasting to a Thanksgiving gathering to remember! Thanks to Belen Aquino for the stunning cocktail photography and to Gather Vintage Tablescapes for the lovely crystal stemware and other table adornments. As I'm sure you've realized by now, one of the guiding principles of my approach to mixology is to provide recipes that are fresh, natural, and lower in sugar content. While cocktails can't be considered definitively healthy, I make sure my recipes aren't definitively unhealthy (in other words, you can enjoy a few and still feel good the next day). I'm constantly on the look for new ingredients that live up to my standards in terms of content and nutrition. My latest find, launched in Chicago's own Green City Market and serving as the inspiration for my next series of posts, is Seasons Soda. All three of their creative flavors are free of refined sweeteners, colors, preservatives, and artificial flavors. Plus, the sugar content is wonderfully reasonable - just 14 grams per bottle. The Honeymint Demi-Sec flavor begged to be paired with cold-brewed green tea for a magically refreshing libation. Because let's be honest, you can never go wrong with the combination of tea, honey and mint. All types of green tea are high on my list but the Japanese Sencha is specially delicious due to its deep and grassy flavor. The strength of flavor ensured that it didn't get lost among the other ingredients of this cocktail. I chose to stay with the Japanese theme and keep the alcohol content light by using sake (a huge thanks to our Binny's helper who recommended this particular variety). Finally, I added a touch of lemon to balance out the soda's light sweetness. The result was lightly effervescent, energizing and perfect for a hot summer day. Shake all ingredients other than the fresh mint in a shaker with ice until chilled. Strain into a tall, cylindrical glass over crushed ice and garnish the mint sprig. Enjoy while reading up on Japanese history and culture on your next lazy weekend. * To make cold-brewed green tea, follow a ratio of roughly 1 tea bag to 8 oz room temperature water. Allow to steep for 30-40 minutes. Cold-brewed tea can also be stored in the fridge for future use. Thanks to Belen Aquino for the stunning cocktail photography and to Gather Vintage Tablescapes for the inspiring glassware. One of the reasons that I so love mixology is that it's an ever-changing science experiment. New inspiration is constantly popping up in terms of ingredients, tools and methods. While I try to keep this blog beginner-friendly, I also want to encourage you to have some of your own science experiment fun alongside me (and to hopefully learn from where I've struggled). This cocktail features several techniques I've been curious to try out - roasting and dehydrating. The bad news is that both require some degree of planning ahead. But trust me, it's so worth it if you want to take your flavor profile and garnish game to the next level. Plus, no complex tools are necessary - a simple oven does the trick. If the summer heat has you avoiding the oven at all costs, try grilling the oranges instead. You'll get a more smoky flavor using the grill and will need to adjust cooking time accordingly. Dehydrating is a completely optional bonus step if you're feeling adventurous. If you've never before seen dehydrated citrus garnish at a cocktail bar, think of a typical citrus wheel with a more papery, translucent texture and shrunken size. The cool thing about this type of garnish is you can make it in bulk and have it on hand for a long time (drying something out is a basic means of preservation). If you don't have the time to devote to this extra step, a thin slice of fresh orange will also make a beautiful martini topper. I didn't have the luxury of time so I baked my orange slices at 200 degrees for 4 hours. While they weren't completely dried out, they were most of the way there and achieved the look I was going for. To craft the Sunshine State of Mind martini, I juiced the roasted oranges, and added vermouth, gin, orange bitters and homemade honey syrup. The result was delightfully sweet with a refreshing orange freshness and a nice depth given by the gin. Fill shaker with a handful of ice, then add juice from the roasted orange. Top with the remaining ingredients and shake vigorously until shaker is frosted (this is a boozy one so the colder, the better). Strain into a martini glass and garnish with a dehydrated orange wheel or a thin orange slice. Enjoy while soaking up the sun on your next beach getaway. *To make honey syrup, heat 1/2 cup honey and 1 cup water over medium heat until honey dissolves. Make sure to stir frequently and turn down the heat if the mixture starts to boil. Syrup can be made in advance and stored in the fridge for a few weeks. Photography and glassware by Belen Aquino. The sun is out and I’m basking in the blissful freedom of being done with an actuarial exam! The hope is that this will be my last (after over 8 years of taking exams) but there may be another sitting in my future depending on how this one went. Regardless, no studying means more time for developing new cocktails and sharing my adventures with you! I’ve been so excited to share this latest development. After travelling to China, I fell in love with milk tea and often find myself having cravings for it. We explored 4 different cities on our trip (Beijing, Nanjing, Hangzhou and Shanghai) and sought out milk tea in each one. Major noms. Authentic milk tea can be difficult to find in the US without making the trek out to Chinatown. If you’ve never had it, I really can’t recommend it enough. Imagine a cold, refreshing black tea-based latte with honey sweetness. You can usually get it in bubble tea form with tapioca pearls but it’s fantastic without them as well. Since the trip, I’ve been testing out creating the perfect milk tea at home. I’ve found that it’s tricky to get the black tea strong enough to maintain flavor when being mixed with milk but not bitter from over-brewing. Then I had a very exciting moment of clarity – what if I used tea-infused liquor and made milk tea in cocktail form? Tea-infused liquor is a lot less daunting than it sounds. Alcohol tends to pull flavor out of anything you add to it – fresh fruit, herbs or in this case, tea. All you need to do is add a few tea bags to a bottle and let it sit for about 20-40 minutes, monitoring the color of the liquor throughout the process (and having a few tastes along the way). When the liquor is infused to your liking, simply remove the tea bags and you’re done! You may need to use more or less time depending on the tea (black and green tea could cause bitterness if kept in too long whereas herbal tea is safe to leave in for longer). You also don’t need to use a bottle from your fancy stash if you’re doing an infusion as most of the taste profile will be covered by the tea. The $10 bottle of London Dry Gin I picked up at Trader Joe’s did the trick without breaking the bank. I chose to use Earl Grey tea over regular black tea as I prefer the floral flavor of bergamot. As a side note, Earl Grey-infused tea is one of the most amazing cocktail ingredients I’ve worked with to date. I chose almond milk over regular milk because I prefer the lightness and slight nutty flavor. Also, dairy-free is the way to be when you're dealing with spring allergies. For the honey component, I recommend making a simple syrup to make the honey easier to mix in. All you need to do is heat 1:1 ratios of honey and water in a small saucepan on medium heat, stirring until the honey dissolves. The syrup can conveniently be stored in the fridge for future cocktail endeavors. Place all ingredients, along with ice, in a shaker and shake vigorously until chilled and slightly foamy. 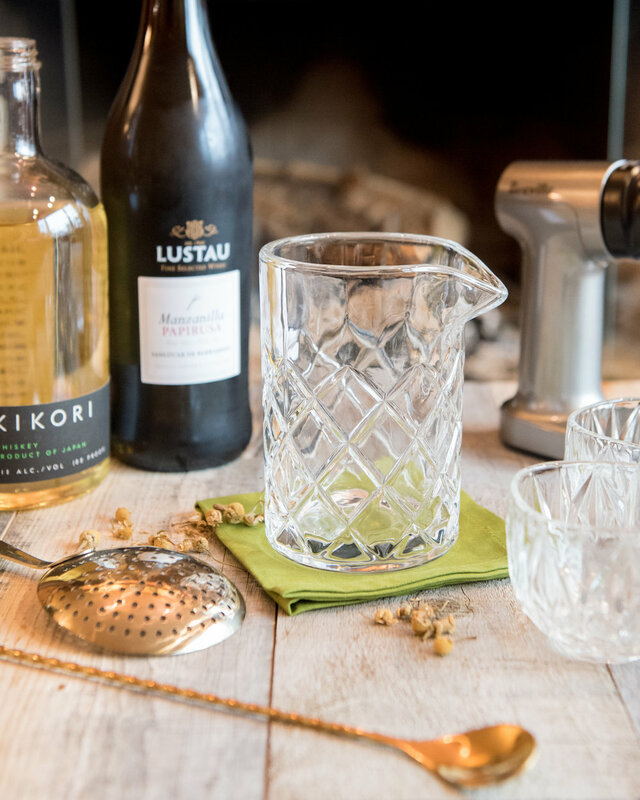 Strain into a coupe glass and garnish with a sweet Chinese treat. Enjoy while giving in to the urge to plan another international vacation. Once upon a time, Will and I visited a magical place of hope and wonder (and fantastic cocktails, food and music): New Orleans. While it was only a weekend trip, we had more than enough time to fall in love with the city's vibrant culture. One of the places that stood out the most in both our memories was The Apple Barrel - a tiny bar on Frenchmen Street. From the aging yet enthusiastic couple (I assume the owners) tending the bar to the wonderfully transportive blues tunes, this place was everything we had hoped for when we set out on the trip. The deliciously simple whiskey cocktails served by our hospitable bartenders just added to the evening's good vibes. This cocktail gives us a way to kick back and reminisce about that perfect evening and I hope it inspires you to make a trip to New Orleans yourself! In this version of The Apple Barrel cocktail, I used Panther, an aged whiskey from Minnesota with a bit more bite than bourbon (a shout-out to our MN-dwelling friends Scott and Bre for such a great wedding gift). The apple cider and honey simple syrup rounds out the bite with some crisp sweetness while the lemon juice keeps the drink balanced (ie. keeps it from getting too sweet). Adding a touch of bitters can help highlight the spice profile of the whiskey, if you prefer to do so. Shake all ingredients with ice until chilled and strain into a mason jar. Serve on ice if you prefer a more refreshing drink or sans ice if you like your cocktails more boozy. Top with a dash of Angostura bitters to bring out a hint of spice. * To make honey simple syrup, heat 1 part filtered water to 1 part honey in a pot on low heat, stirring frequently until honey is dissolved. Be sure to not let the mixture boil. When honey is dissolved, remove from heat and allow to cool. Unused simple syrup can be stored in the fridge for 1-2 weeks. I highly recommend making the simple syrup ahead of time if you plan to make this cocktail so you don't have to go through the agonizing impatience of waiting for the simple syrup to cool on the spot.